Many lesions are innocuous and can be easily diagnosed and named based upon their appearance alone. However, some lesions are not as easy to identify and require additional diagnostic steps, such as a biopsy (removal of a piece of the lesion to examine under a microscope). 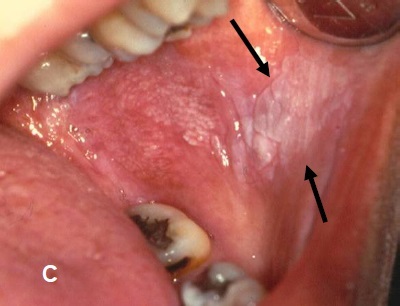 A small percentage of these lesions may be premalignant or even malignant. 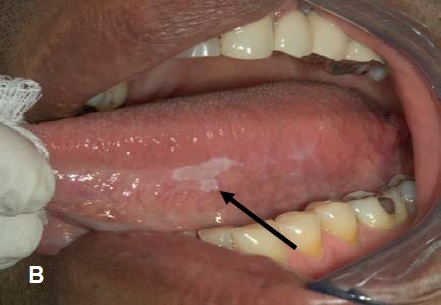 Figure A: The whitish line is a common lesion that develops as a reaction to pressure of the soft tissue against the teeth. This readily identifiable lesion is termed linea alba (white line) and has no potential for cancer. Which lesions might raise suspicion? Patches that are, red, white or mixed red/white in color, or that may also be ulcerated, especially when found on “high-risk” sites such as the side (lateral surface), underside of the tongue (ventral surface), floor of mouth, or at the back of mouth/top of the throat (oropharynx). 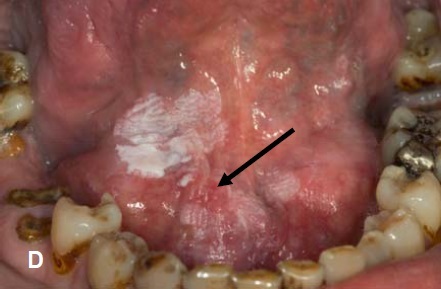 A white patch that cannot be wiped off with gauze and for which an explanation is not obvious to the dentist may be defined as a leukoplakia (Figure B & C next page). Similarly, reddish patches with no obvious cause can be defined as erythroplakia (Figure D next page) and mixed red and white areas termed erythroleukoplakia (Figure E next page). 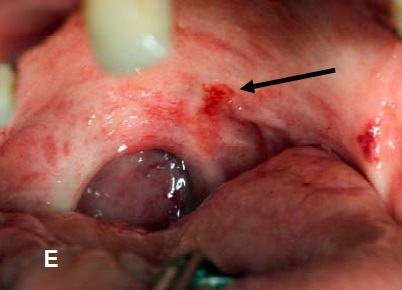 Lesions with a red component carry the highest potential for being premalignant or becoming malignant. Some dentists use additional technologies to look for or characterize suspicious lesions (known as diagnostic adjuncts). It is essential to establish an accurate diagnosis for all such lesions that raise suspicion.